Appendix B is a rccord of the principal sources on automatic weapons. These sources include books, magazine articles, pamphlets, manuals, and official reports and documents. Each entry includes author or issuing agcncy, title, date, series number, and other identifying data, followed by a brief description of the contents and special features of the work. For security reasons, many references on recent and proposed weapons under development in the United States and other countries can not be listed in this volume, which has been prepared for general distribution. Other sources which must also be omitted are official correspondence on various weapons and personal correspondence and conversations with inventors, manufacturers, and researchers in the field of ordnance. The appendix is arranged in two sections. Section I is an alphabetic grouping of general works on machinc guns and other automatic weapons. Section II contains works on individual weapons, inventors, or manufacturers and the entries are listed under specific topics, arranged alphabetically. Air Corps --Ordnance conference. IB Jun 1937. Conference between representatives of the two services. Discussion of: experimental airplane projects; relative merits of all guns and ammunition; aircraft cannon; machine guns: ballistics; and other topics. Includes chapters on hand and shoulder weapons (German Mauser, 7.92 mm, German antitank rifle, 7.92 mm, Pz, B.39, Schmcisser machine pistol, 9 mm MP40, Bcrgmann submachine gun, 9 mm) light machine guns (MGH, Breda Ml930, Sfitalui light mg, model 1937, French light mg: cal. 7.5 mm, M1924-29, Jap Nambu machine rifle, M1922) and heavy machine guns (Jap heavy rug, cal. 7.7 mm, model 92). Illustrated. Report on machine gun competition. 17 Feb 1939. Translation of report on tests of seven different European weapons for Argentine government. Colt weapon, already the Argentine regulation machine gun, made best performance. L'armemcnt de nos avions militaires. (In I'Aerophile, 1936, pp. 123, 170, 194, 218) Series of articles on French air armament. (In French.) The automatic machine gun in our Navy. (Manuscript1! Summary of Navy's use of machine guns in past 50 years. Balleiscn, Charles E.
Translated from Sep 1943 German document of Deutsche Waff en and Munitionsfabriken A. G., Posen. Process used on FLAK 38, MG 151, 30-mm MK 108. Illustrations. Principles of firearms. N. Y., 1945. 146 p. <4The purpose of this book is to expound the concept that an automatic firearm is a piece of machinery operating in accordance with well-known laws of physics and hence capable of being analyzed and designed in accordance with common engineering practice." A limited number of familiar weapons arc analyzed from the viewpoint of a mechanical engineer. Chapters on gun barrel, recoil, functions, systems and existing types of automatic weapons, trigger and sear mechanisms, feeds, sights, design problems, testing, exterior ballistics and gun mounts. Illustrations; bibliography after each chapter. (BIOS translation BTOS/Gr. 2/HEC/l 1707/TII) Translation from Rheinmetall publication. Contents: Supply of energy for the loading operation; Locking of the breech mrchanism. Closed and open systems; Cartridge feed and loading; Extraction and ejection of case; Device for directing flow of gas at muzzle; Springs and rubber buffers as accumulators; Accelerating devices for breec.h mechanism; Safety and locking devices in general. Charts and drawings. Small arms manual, London, 1942. 232 p. Covers rifles, machine guns, machine carbines, revolvers, pistols. Summarizes knowledge on British, U. S. and enemy weapons: Identifying data, operation, stripping, stoppages and special features. Drawings included. Some weapons of war as improved by recent American inventors. Washington, 1883. 98 p.
Includes chapters on small arms, revolvers and machinc guns. The latter covers Billinghurst & Requa, Gatling, Hotrh-kiss, McLean, Gardner & Lowell. Illustrated. "A succinct review of development and of certain characteristics of the more modern automatic weapons. '1 Author, famous designer and official of Hotchkiss Co.
Includes anti-tank weapons, barrel vibrations, life and wear of harrels, supplementary arrangements, systems with nonlocking bolts, gas operated weapons, extraction, recoil. Material'naya chast* strclkovogo oruzha. Kniga pervaya. Moscow, 1945. MatcriaPnaya chast' strelkovogo orushiya. Kniga vtoraya. Moscow, 1946. 832 pages. (In Russian) ("Evolution of small arms," vol. 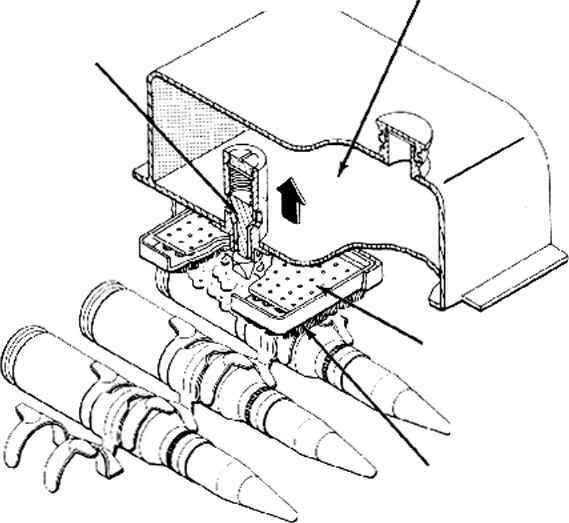 2) Description, data and drawings of automatic guns of all nations. Also breakdown drawings. Translation of pages 5-42 of subject book. Chapter I, "Machine ^un supports and machine gun mounts." Ch. II— "Light machinc guns.'' Russian ms attached. A century of guns: a sketch of the leading types of sporting and military small arms. London, 1909. Section on Maxim is included. Illustrated. Excellent elementary article on development and principles of Galling, Maxim, Browning, Hotchkiss and Lewis guns. Illustrated. Describes use in WW I. Illustrated. Aircraft armament. N. Y., 1945. Details on aircraft bombs, aircraft machine guns, aircraft cannon, ammunition, turrets, foreign aircraft weapons, antiaircraft weapons, gunnery training, future weapons and air warfare. Illustrated. Kurs artillerii. 5th edition. 3 volumes. St. Petersburg, 1907. The modern machinc gun. (In Current History, vol. 5» Oct 1916, p. 737-40) Brief historical article. Report of visit to European small arms and small arms ammunition factories, year 1929. A detailed account, with many photographs, of the current (1929) armament used in ten European countries, and a discussion of the production of weapons and ammunition in the factories of these countries. Contains a tabulation of light machinc guns used by the various countries. Colt's Patent Fire Arms Mfg. Co.
A century of achievement, 1836-1936. (Colt's 100th anniversary fire arms manual) Hartford, Conn., 1937. A history of the firm which manufactured Gatling gun, Colt-Browning, Maxim, Benet-Mereie, Vickers, and Browning guns. Illustrated. United States rifle and machine guns. N. Y., 1917. Illus., 328 p.
Contains descriptions of operation and mechanisms of Springfield and Enfield rifles; also of IJ. S. machine rifle, cal. .30, Model 1909, Lewis machine gun and Vickcrs Model 1915. Illustrated. Rapport technique. Vol. III. Armement: Bombardement aerien; Tir a la mitrailleuse; Tir au canon. 1923. Based on Davis gun, two types were developed by Germans in WW II. (1) 14-inch forward firing gun mounted in Do 217. (2) S. G. vertical firing guns (45-mm and 3 cm). Also experiments with jet guns in aircraft by Rheininetall, which never went into service. Illustrated. Outline of the development of the machine gun from Catling to Lewis with emphasis on American origins of the various weapons. Illustrated. America's munitions, i917-18. Washington, 1919. Author was Asst. Sccrctary of War and Director of Munitions. Chapter on machine guns. Illustrated. Discussion of ballistic principles, systems, use for antiaircraft and aircraft installation. L'avenement des armes automatiques; technique et emploi des arms, organisation des unités de tir. Paris, 1924. (In French.) Technique and use of automatic weapons arc covered in first part. Second part summarizes development and history of weapons. Illustrated. Describes trend toward more powerful armament (20 and 37 mm cannon). Illustrated. American guns in the war with Germany. N. V., 1920. Contains chapter on machine guns, with statistics on production. Illustrated. Descriptions of arms of American patent or manufacture. Militai y encyclopedia: a dictionary of military knowledge. N. Y., 1885. Brief treatments of military topics, including automatic weapons. Illustrated. Complete descriptions of most important 19th century weapons. Guns for firing from airplanes. 14 Nov 1917. 22 p. Author comes to conclusion thai airplanes should carry 75 mm gun firing at low muzzle velocity to shell ground areas. Sovrcmieunoye polozhenie pulemietnavo diela. 1907. 104 p.
(In Russian) "Present status of automatic guns" lecture read in the Society for Promotion of Military Knowledge. Illustrated, with captions translated into English. Zvolyupiya strelkovogo oruzhiya. Chasf II. Razvitie avtomaticheskogo sruzhiya. Moscow, 1939. (In Russian) Describes and illustrates Soviet and foreign automatic weapons. Masrhinengewehre, ihre technik und taktik. Berlin, 1909. (In German) Includes Schwarzlose, Skoda, Bergmann. Illustrated. Maschinengcwehre. ihre technik und taktik, neueste fort-schritte, jahrgang 1913. Berlin, 1914. Die neuesten maschincngcwehre, fortschritte und Streitfragen. Berlin, 1910. ("Latest machine guns; their progress and questions of dispute") (In German) Includes Odkolek mg, Perino mg. Illustrated. Maschinengewehre, ihre technik und taktik. Neueste fortschritte, jahrgang 1912. Berlin, 1913. Arms and the men. Garden City, 1934. 58 p. Describes organization and personalities of world's munitions firms. Portraits of leaders. On mitraillcurs, and their placc in the wars of the future. (In Journal of the Royal United Service Institution, vol. XIII, 1870, p. 539) 17 p.
Observations on Ager, Claxton, French, Catling and Montigny weapons. Illustrated. (In French) Lists German machine gun factories during WTorld War 1. Brief descriptions of T. u. F. and Gast weapons. Report on comparative tests of automatic rifles. 20 Feb 1924. Tests were made in 1923 on Berthier, Browning, St. Etienne, Hotchkiss (belt and magazine types), Madsen and C'hatellerault. General estimate given for each. Decision was made to adopt Chatellerault. Drawings and tables. German aircraft armament. (In The Aeroplane, Jun 14, 1940, p. 794). Describes Rheininetall guns installed in WW II German guns. Illustrated. Translation of aircraft armament comparative chart by Technical Intelligence Branch, Ord Dept. Tabulation gives caliber, designation, construction, feeding mechanism, weight, cyclic rate, vo., kinetic energy at muzzle and mount. Armi c tiro. Rome, 1943. The following weapons are described and illustrated: Terrel machine cannon, Barnes machine cannon, Ripley gun, Douglass & Brett cuns (1864), Gatling gun and cartridges, French mitrailleuse, and Fold gun. Describes and illustrates early weapons, including Bailey, Gardner, Gatling, Palmcrantz, Ager, Taylor, Vandenberg, Lowell and Maxim guns. Discussion, with illustrations, of Billinghurst-Requa, Gatling and other Civil War guns, Ager, Montignv, Claxton, Gorgas and Vandenberg. Discussion of development during World War I. Illustrated. Instructions for use of permanent staff instructors ... in regard to care, inspection and repair, etc., of small arms, machine guns and bicycles. London, 1933. Technical intelligence summary no. 74. 28 May 1942. Contains section on Italian medium machine guns with specifications. Textbook of small arms. London, 1929. 427 p. Contains definitions of terms. Chapters on revolvers and self loading pistols, machine guns and light machine guns, small arm arnmuniiton, ballistics of small arms. Appendix IX contains details of machine guns of various powers in tabular form. Soviet aircraft guns. Oct 1949. A report on aircraft guns used by the Soviet Air Force during WW II. Not intended to include technical details but rather to indicate type of weapon and make comparison with similar weapons of known performance. Includes Shkas 7.62 mm, BS 12.7 mm, Shvak 20 mm, VJa 23 rnm and NS 37 mm, also turrets and mountings, maintenance and ammunition. Photographs and tabulation of data on guns and ammunition. Preference finally given to Ocrlikon. Handbook of foreign aircraft guns. Nov 1912. Summarizes German, Italian, Russian and Japanese weapons (MG 15, 17,81, 131, 151, 151/20, FF MK 101) (Breda, Shkas, Berezin, Shvak. Experimental, Oerlikon). Diagrams. Table on weight of projectiles fired per minute—German and Italian. Guns, allied and enemy. London, 1940. Contains 100 photos and diagrams. Hatcher, Julian S. Hatcher's note book. Harrisburg, 1947. A standard reference book for shooters, gunsmiths, ballis-ticians, historians, hunters, and collectors. Contains brief history of service cartridges, automatic gun mechanisms, development of machine guns, receiver steels & heat treatment, headspace, recoil, notes on gunpowder, gun corrosion, and random notes. Illustrated. Describes blowback, retarded blowback and blow-forward principles. Illustrated. Part II (same, May-Jun 1933, p. 339). Describes recoil operated (short arid long) and gas operated types. Future needs are longer range, more mobile vehicles, more powerful projectiles, better fuses and better powder. Machine guns. Menasha, Wis., 1918. Part I. Materiel, by Maj. Julian S. Hatcher. Part 11. Practical handling of machine gun fire, by Maj. Glenn P. Wilhelm. Part III. Machine gun tactics, by Maj. Harry J. Maloriey. Based on notes prepared for instruction at the first U. S. Army machine gun school at Ilarlingen, Texas. Part I contains historical chapter and chapters on Chau-chat. Hotchkiss, Benet-Mercie, Lewis, Maxim-Vickers, and Colt! Aircraft armament, past and present. Southport, Eng., 1943. Part T. Machine guns and mounting of the synchronizing gear. (From early Lewis to modern Browning) Illustrated. Notes of French ordnance. 1717 to 1936. n. d. Brief descriptions of French models of machine guns and automatic rifles. Illustrated. What the citizen should know about our arms and weapons. X. Y., 1941. Contains chapter on machine guns. Illustrated. Gewehre frei! Weg und ruhrn der maschinengcwehrwaffe. Berlin, 1938. 215 p.
A historical summary of use of machine i^uns in warfare. (In German} Contains numerous illustrations & bibliography of German titles.